1.2 What effects mustard sauce has? What effects mustard sauce has? Its spicy and intense flavor is a warning for delicate stomachs: indeed, mustard is mildly irritating to the digestive mucosa, so those who suffer from heartburn, dyspepsia or digestive ulcers should avoid consuming it. Grind the above mixture until all the grains split without being crushed completely. Let stand 1 hour in refrigerator. Cook the mixture over low or medium heat, uncovered, so the spirit of the wine vinegar evaporates. Add 1 tablespoon of salt, and add more vinegar if necessary. Bake for 30 minutes, stirring constantly. Remove from heat and let it cool. Add 2 tablespoons of lemon juice when the mixture is cool. Grind the seeds of the above mixture to form a thick sauce, then, mix with whole seeds. So we get a sauce with more flavor. 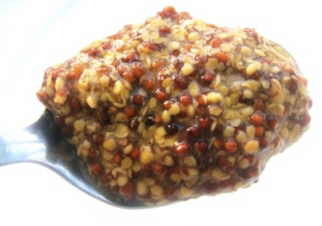 Mix the crushed mustard with whole mustard seeds in vinegar and salt at will. Do not add water to the recipe because it would shorten its shelf life. If desired, you can add oil. Black mustard is very irritating. We do not recommend it in condiments, although it can be used. If using black mustard, take it in small quantities or mixed with (the less spicy) white mustard.